Staying in Singapore is expensive. Period. Budget travellers have it best, as hostel rooms can be had for $20 a night. Most midrange hotels are more about location than quality. However, if you’re willing to spend, luxury digs will make you never want to leave. While there may be a slew of hostels in Singapore, most of them aren’t anything more than small rooms jam-packed with doubledecker beds. Private rooms all have shared bathrooms. Note that hostels tend to get booked up on weekends, especially the (limited) private rooms, so book in advance. Little India is the place with the most budget beds. Service quality also varies dramatically, from ‘can’t be bothered’ to ‘friendly and helpful’. Free wi-fi at most hostels. From top-notch places like the Raffl es Hotel and the Capella in Sentosa to cool boutique options like Naumi, Wanderlust and the New Majestic, good hotels are plentiful in Singapore. Standards are high, but then so are the prices – check web off ers for the occasional bargain. Most of the midrange and high-end options are expensive identikit international chain hotels. Midrange cheapie chains (Hotel81, Fragrance) that sometimes rent by the hour off er alternative no-frills accommodation in decent locations. (check the classifi ed pages of the Straits Times for listings). Rents are high, regardless of how near or far from the city centre you are. Probably the best place to start looking for long-term rental in Singapore is Singapore Expats (www.singaporeexpats.com), which has detailed information on the diff erent districts, outlines the whole rental procedure and carries an apartment search engine. The Singapore section of www.craigslist.org is also a good place to look for long-term stays. In Singapore’s midrange and top-end hotels, room rates are about supply and demand, fl uctuating daily. Travellers planning a trip to Singapore need to keep this in mind, especially if you’re planning to come here during a major event. For example, room prices TRIPLE during the Formula One night race. Be aware that top hotels usually add a ‘plus plus’ (++) after the rate they quote you. Ignore this at your peril. The two plusses are service charge and GST, which together amounts to a breezy 17% on top of your bill. All prices quoted in our listings are from the day of our visit inclusive of the ++ tax; your own price may vary. Apart from booking directly on the hotel’s website listed in our reviews, you can also book rooms on these websites. 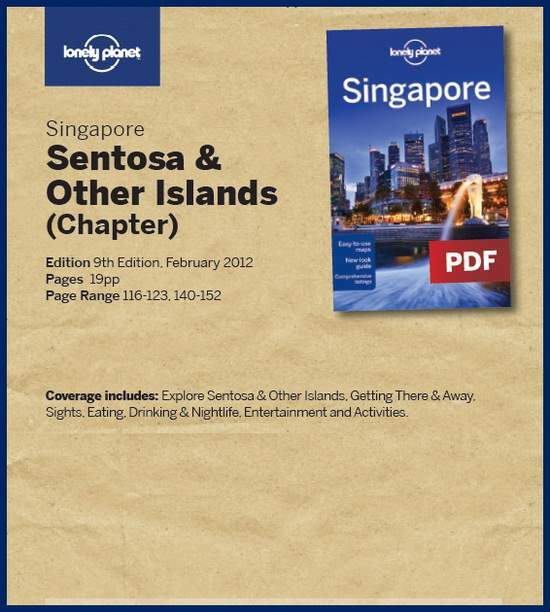 If you want to learn more about Santosa Island, you can dowload this great travel guide from Lonely Planet absolutely for free. Just press the the picture below to start your download. « How to Choose The Best 1 Bedroom for Rent in Bangkok?